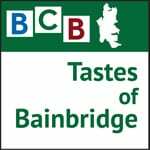 Listen here as BCB host Bob Ross heads down to this week’s Bainbridge Island Farmers Market to talk with Gayle Bair about her beautiful and delightfully practical pottery. 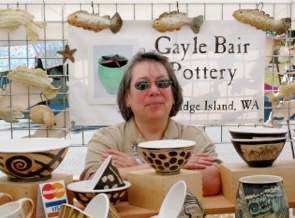 Inspired by her background in two dimensional art, Gayle took up pottery in 1996 and did not look back. 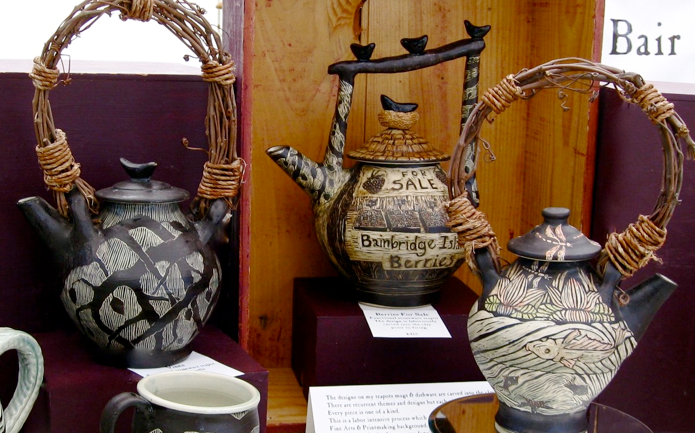 Her amazing teapots, French butter dishes, bowls and pitchers are collector pieces each and all. But at the same time they are durable, lead free, and dishwasher safe! Gayle applies an oxide-rich slip to her pieces prior to firing. Allowing it to dry slightly, she applies designs inspired largely by environments she has known or visited using a labor intensive process called Sgraffito. After being fired in an electric kiln to over 2200F, the resulting pieces emerge to enchant discriminating buyers across the Northwest. 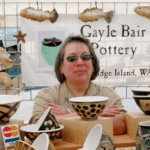 So come on down to this week’s Farmers Market: there’s still time to take a look at Gayle Bair’s fabulous and highly functional pottery.